The end of April found us driving to Chester, England. This is where our van journey commences and Jess and I made one of the more defining purchases of our trip. Victor Whiskey, a 1995 LT35 VW, was filled with as much character as we were adventure. The rest of April, May and most of June found us cruising through Europe and North through Denmark and Sweden. We crossed the border into Norway at the small mountain town, Åre. 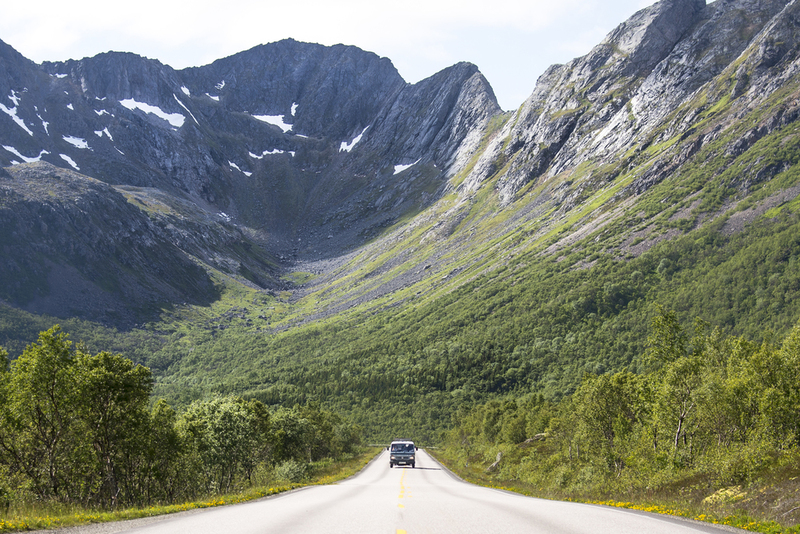 Driving the E6 North following the Westerly coastline of Norway, we were instantly struck with the mountain magnitude in which Norway starkly contrasts the neighbouring Sweden. Driving along the fjords, Jess and I knew we had found what we’d been hoping for in our travels; sheer cliff faces plummeting into deep blue and turquoise seas. We had four days to cruise to Bodø, where we were to ferry to Lofoten. We made our way North, stopping at pullovers outside small fishing towns, finding isolated beaches to spend the night. Catching fish from the roof of Victor, cooking over campfires and beers on beanbags on our sun-deck, set the scene for our most anticipated destination. Apart from the occasional urge to pull over for a long-board down some of the seductively smooth and windy mountain roads we cruised without delay. Sitting in our kayaks at 2am, drifting until we reached a point in the fjord where the water was so utterly still we ceased to make ripples, made for a good time to reflect on the past couple of months. We had planned a 6am kayak trip through Reinefjorden. However, at midnight, after looking at the water and the sky from our chosen camping spot we decided not to wait. We launched and began paddling through to Kjerkfjorden, where the sun was still present, setting the sheer cliff faces aglow with an orange and pink haze. After the sun disappeared we paddle back towards Forsfjorden where we reached the sea kayakers dream of complete stillness, glassy waters and waterfalls. We realised that our whole trip so far, starting in Southern France at the very start of summer and heading North through Belgium, Germany and Sweden were all in preparation for our time in Lofoten. We had been chasing the midnight sun. Our nights became shorter and our days longer until we had no known ‘night-time’ at all. We have become somewhat nocturnal I guess. With the sky starting to turn golden and begin its setting at 10pm- merging into sunrise, with the final shift from golden, pastel skies into the crisp blue of morning at 4am, who would risk sleeping through that?! 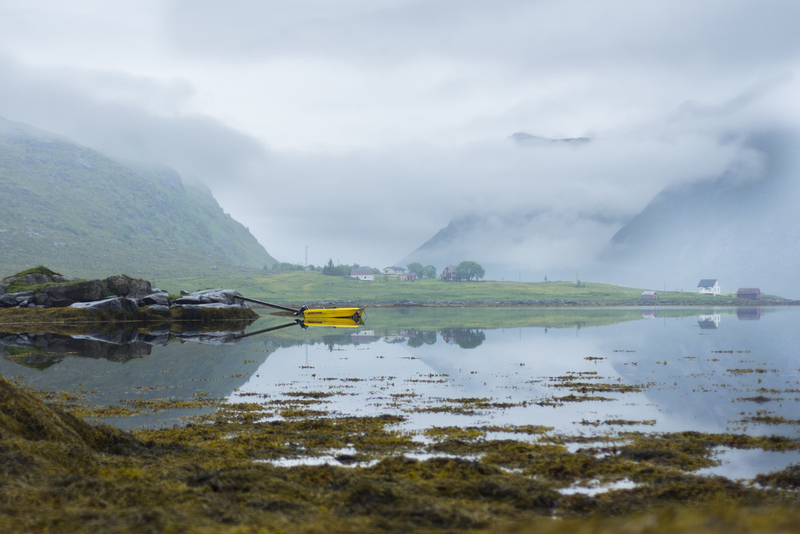 Our time up in Lofoten rolls into a blur of hiking and fishing. Apart from the endless sun and forever being awed by the mountains, fjords and surrounding nature, the people were also a highlight. Whether it was in the local village or the summit of a mountain, all people we seemed to meet were undeniably open and friendly. Possibly due to the minimal population base or due to the mountain air, everyone appeared to genuinely have the time and desire to stop and chat, conversations that went far beyond small talk, which can be challenging mid way up a difficult climb, I can tell you! This created yet another reason to fall irrevocably in love with the place. Prior to our arrival in Lofoten we were both feeling a touch anxious. We had built up the wonders of this place so much in our minds that we feared our expectations might have got the better of us. We need not have worried. As unforgettable as we imagined Lofoten to be, it was so much more! We suffered mild delirium, which happened shortly after our arrival; this occurred primarily due to sleep deprivation caused by our need to stay up all day and night to soak in the wonders of the place as well as the general sleep inhibiting light. Our pituitary glands were on overdrive! Surviving on minimal sleep paid off, as we both felt extremely satisfied with every un-wasted moment of our experience chasing the midnight sun.